I'm a freelance writer/photographer living in the East Village neighborhood of New York City. Photography buffs and architecture and design enthusiasts who clamor for the chance to shoot some of New York City's most elusive interiors will be out in full force on October 9–10 for OpenHouseNewYork (OHNY). The little known event, now in its eighth year, enables New Yorkers to literally go where they are typically unwelcome: underground, overhead, and behind the doors of some fairly exclusive residences and arts studios, including one occupied by sculptor Tom Otterness and several repurposed factory buildings that house glass blowing works, such as Urban Glass, and art studios at the old Brooklyn Navy Yard. Tours of hundreds of well-known buildings and skyscrapers are also included as part of the jam-packed weekend event, including the Chrysler Building, the Woolworth Building, the 69th Regiment Armory, as well as one and seven World Trade Center. The possibilities are endless and dizzying: Go behind-the-scenes at the Apollo Theater or the giant screens that light Times Square. Climb to the top of the Cathedral of St. John the Divine. Walk the unfinished stretches of the HighLine. See the hidden Vanderbilt apartment inside Grand Central Terminal. 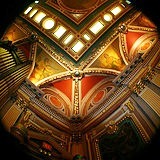 Be mesmerized under the colorful spectacle that is Grand Masons Lodge (pictured). Go underground into the Atlantic Avenue Tunnel. Walk through Manhattan's oldest cemetery. Visit Theodore Roosevelt's birthplace. Learn what became of the oldest medical clinic in Manhattan, circa 1883. Marvel at the restoration of the Eldridge Street Synagogue. The sites are borough-wide and include a vast array of new and old architecture that is presented and discussed with expert guides, such as master architects, engineers, city planners and preservationists. Although access to some sites requires pre-registration, all are free. Expect moderate to lengthy wait times, depending on the popularity of individual tours, but revel in delight when comparing notes with fellow travelers. Nearly all sites allow photography (check first with tour guides), though an ongoing competition is also part of the fun, with images used later in printed press materials for OHNY as well as on its website. Interested parties may also follow the OHNY Twitter feed for instant updates about wait times, fully booked tours, and special offers. Kids can join in the action, too, as special family-friendly events are planned throughout the weekend, such as drawing activities at Kentler Gallery in Red Hook, a skyscraper costume-making workshop in Battery Park, tours of historic Richmondtown, and a scavenger hunt in Crown Heights. So, come out for the architecture that has made the New York skyline iconic and enjoy some hidden gems, unsurpassed educational opportunities, and family fun. You'll learn more about sustainable building projects in an urban arena and marvel at just how far we've come in the last century. Why? Because New Yorkers prefer all access. Where: Throughout the five boroughs. Cost: Free; Reservations required for some sites.